Concentrated blue colour for endless mixing possibilities to help you produce truly bespoke shades in L'Oréal's Inoa permanent hair colour without ammonia. What's more, thanks to Inoa's ammonia-free formula, there's no bad smell or the burning scalp sensation that ammonia can sometimes cause. Instead, hair is beautifully coloured and left in fabulous condition. 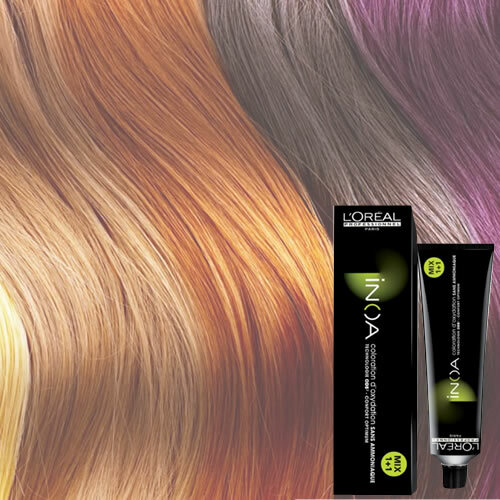 L'Oréal Inoa comes in a 60-gram tube which you mix 1:1 with the appropriate Inoa Oxydant. Buy any 11 tubes of L'Oréal Inoa or Inoa Supreme and pay for only 10, taking the average price per tube down to an amazingly low £6.91!! Cream peroxide especially optimised for Inoa and containing conditioners including L'Oréal's wonderful Ionène G.
Comes in 1-litre bottles (enough for 16 applications) and available in 3 strengths: 10 vol (3%), 20 vol (6%) or 30 vol (9%). Quality tinting brushes available in 5 attractive colours—Purple, Pink, Orange, Black or White—and in 2 different sizes (Pink is only available in standard size, White only in large.). Vibrant orange or classic Black and roughly twice the height of standard tint bowls for reduced splashing. Non-slip, rubber base and graduated up to 320 ml. WHAT FANTASTIC TOOL... THE BLADES ARE SO RELIABLE AND SHARP... THEY LINE UP ANY HAIR LINE WITH EASE.. NO MESSING WITH TRYING TO GET THE BLADE SET.. LOVE THEM..